We have an elderly cat, who in the main isn't much bother. However, one evening a few weeks ago, I caught her having a wee on the corner of our genuine 4m x 3m Persian rug! Seriously, what on earth did she think she was doing? As it was just before bed, I mopped it up the best I could, to clean up properly in the morning, but I noticed the rug ponged a bit - more like stale, old wee. In the morning on close inspection, it became apparent she's been doing it for some time. The rug reeked and the engineered wood flooring was ruined, because it had seeped into the end join. We got some professional bio cat urine cleaner stuff, which is supposed to neutralise the odour. Which we have used many times now, we've also cleaned it twice with the carpet cleaner. It has reduced the smell somewhat, but I'm still very aware of the smell - even though others say they can't smell it. I also think we've ruined that rug a bit as the dye has run and it looks quite "muddy" in that corner now. So we contacted a specialist oriental rug cleaner, who has quoted us nearly £600 to clean it. This now has created a quandary. Obviously when we bought it, it was quite pricey, but we considered it an investment buy. We've already spent £1000 having it repaired because of mouse damage (courtesy of the cats again) - paying that much hurt, but it meant the rug was back to normal - like nothing had happened. But we're not so sure about paying out again (we're not sure the insurance would cover it), when the result may not be as satisfactory as the first. I think we've made too much of a mess of the colours in that one corner and I'm not convinced, the smell will be completely removed or that the colours won't run more. So the question is, do we commit to paying the money with the hope it does make it better or do we just cut our losses, get rid and try to find something similar or some sort of replacement? At 4 x 3 metres it won't be cheap. We're really torn as the rug goes perfectly in the room and I do love it, but I'm loathed to spend money when the result isn't going to be that great or it looks worse than before. Can the rug be rotated to hide the soiled corner under furniture if a rug doctor can't fix it? Sounds as though you really don't want to get rid of the rug so I'd spend the money on getting it repaired. You might regret buying a replacement you don't love as much! Not sure what you do with the rug but your cat could be suffering from kidney failure as the condition can cause them to wee in inappropriate places. My mum and dad have had cat most of my life, in latter years they can start this due to health issues as mentioned, silly question possibly but would the pattern allow it to be made slightly smaller taking the bad bit out? We have elderly pets and they do have 'accidents' sometimes. I have a steam cleaner and that works a treat. We have a couple of Persian rugs that I've carefully used the steam cleaner on and it made the colours bleed a little bit in one spot, but it's not very noticeable. Also, the steam removes the smell. Buying a steam cleaner is cheaper than getting the rug repaired and it's a very useful thing anyway. We have a Karcher. I think it's the SC3. You possibly could also rent one somewhere. And your vet could check your cat, she might have a health issue that can be resolved. I think if you get the rug repaired, you are going to be continually worried about it being damaged again. When you look at it, instead of thinking 'what a beautiful rug' you are going to be thinking 'has the cat peed on it again?'. I think I'd replace the rug with a cheaper alternative that will be more resilient to the damage that is bound to occur when you have pets (or children). Perhaps you could store the damaged rug until such time as it you don't have pets and can either get it repaired or tolerate the damage. I should declare...I'd rather have a home with pets than a home with a precious carpet! I think I’d hide the corner under furniture. I’m sure it can’t smell that bad after all that cleaning. After all, you didn’t notice the smell before until you saw the cat doing it, even though it had been happening for a while. Also, have you had the wood flooring replaced? Otherwise that is likely to be contributing to the smell. The joy of elderly pets. Sometimes cat scent mark if they feel insecure or worried (new cat in the home?) and both sexes do it. A rug seller told me that oriental rugs are tougher than you think, that in the countries of origin often animals sleep on them! 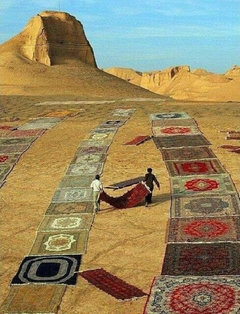 I’m not sure how true this is but I know Persian rugs are washed and then dried on sand dunes. Here’s a pic to prove it. I agree that you can clean it yourself with some carpet cleaner - would Shake & Vac get rid of the smell maybe? Then maybe roll it up and tuck it out of the way. Good luck with the rug. I had this happen with my very elderly cat towards the end of her life, and the vet thought it was a sign of distress (she had the equivalent of dementia). Those plug in Feliway devices, recommended by our vet, definitely helped soothe her last months. Poor kitty. Do take her to the vets and get her checked out. As for the rug I was looking a while back how to clean wool needlepoint (got a couple of antique chairs with needlepoint seats) and seems that a sensitive fabric cleaner is mostly used for tapestry’s, rugs etc. Woolite is easily available and there are some good reviews on Eucalan. Both need to be spot cleaned (dab on , dab off) and don’t use water especially warm water as this will make the colours run. Might be worth a try before the expense of a professional clean. I haven’t cleaned my seats yet so couldn’t say if it works but there are plenty of ‘how to’ videos on you tube. I think if I was in your situation I’d try leaving quite a lot of bicarbonate of soda on the affected area overnight to see if it absorbs the smell before going to any further expense. Oh yes, bicarbonate soda is a good idea! Bicarbonate of soda is my go to cleaner to get rid of scents, stains and general cleaning I sometimes mix in some fabric conditioner depending on what I'm cleaning. Firstly hope your cat is OK and that you salvage your rug.